Canadian WW1 records complete - at last! Can you help with this cold case? Do DNA tests identify equal numbers of maternal & paternal cousins? Cloning: dogs today, grandpa tomorrow? When Library and Archives Canada announced in 2014 that they planned to make available online all of the service records for the men and women who volunteered to join the Canadian Expeditionary Force in World War 1 - whether as soldiers, nurses, or chaplains - they hoped the project would be complete by the end of the following year. But in the event it was only this week that LAC announced that the 5 year project (it actually began in 2013) was complete - all 620,000 records, many extending to dozens of pages, are now available free online (you can search them here). I've found 6 of my 1st cousins twice removed amongst the soldiers who fought for the Canadian army - 5 had recently emigrated, but what the other was doing in Canada, I have no idea (his family were in Norwich, England). Only 4 of the 6 came back - one was killed in battle, the other died of a self-inflicted wound (how awful things must have been for him to take his own life). An article published on the BBC News site on Friday morning shows a photograph of a man whose body was found near Weston-Super-Mare a year ago, but whose relatives have yet to be traced by police. Estimates from Ancestry suggest that we each have around 1300 relatives who are 4th cousins or closer, so there's an excellent chance that one of the 65,000 recipients of this newsletter is related to the mystery man. If so, please get in touch with Avon & Somerset Police right away! UPDATE: the BBC article has now been updated to show that next-of-kin have now been traced. I understand a LostCousins member provided the names of his brother and sister to the police on Friday, but they may well have had other leads. Coincidentally my wife and I started watching the first series of Unforgotten on Thursday evening: it begins with the discovery of a body hidden under a concrete floor - in that case the only clue to his identity was a car key. Emmeline Pankhurst is a familiar name, but it's not the name she was born with. Pankhurst was, of course, her husband's surname - she may have been a leader in the fight for women's suffrage, but she still took her husband's name when they married. Her maiden name was Goulden. What I didn’t realise until recently was that she wasn't always Emmeline - when she was born her forename was registered by her mother as Emiline, a far rarer spelling. By the time she married barrister Richard Marsden Pankhurst at St Luke, Weaste, Salford in 1879 she was using the more common spelling, but in the 1871 Census her forename is garbled, whilst in 1861 I can’t find her at all (she's certainly not with her parents - but see Stop Press). I can’t find a record of her baptism, either, though I've only looked online. This is only the second certificate I've seen for a late birth registration, or to be more precise, only the second where the correct date of birth is given. Though there's even some doubt about that - Emmeline Pankhurst always claimed she was born on Bastille Day, 14th July. Another story about Mrs Pankhurst is that she was imprisoned in the tower of Big Ben (now known as Elizabeth Tower), but according to the Parliamentary Archives there is no record of her incarceration there. Tip: not all local register offices can provide facsimiles of register entries - some will supply typed or handwritten copies instead. I contacted the register office to check before placing my order. 23andMe, the second-biggest consumer DNA testing company (after Ancestry) has announced a collaboration with Glaxo Smith Kline, the global pharmaceutical company originally founded in England (at one time their head office was just a few miles down the road from LostCousins). GSK are investing $300 million in 23andMe according to GSK's announcement, though I couldn't see it mentioned in the email 23andMe customers received from CEO Anne Wojcicki. I recently tested with 23andMe - there are some nice features, but I was matched with far fewer cousins than at Ancestry, probably because 23andMe attracts users who are more interested in health than ancestry (so opt out of the cousin-matching process). And my closest cousins haven't responded, which is a bit frustrating. But this tie-up is all about health, not ancestry, and you don’t need to be a 23andMe customer to benefit from the innovations that result from the collaboration. It'll be interesting to see how it works out - there's an initial 4-year period, with an optional 5th year. I was asked this question recently - and the only thing that surprised me was that nobody has asked before! Of course, other things being equal you will get roughly equal numbers. But there are usually confounding factors that have far more impact on the numbers than the inherent randomness in the way that DNA is inherited. For example, if one side of your family came from Outer Mongolia it's likely that far fewer cousins from that side have tested. Similarly, if one side is Catholic you can expect many more cousins on that side - because Catholics tend to have big families. So both the absolute number of cousins and the likelihood that those cousins have tested will have an impact on the numbers. But they're not the only things that can skew the numbers: some cousins will be more likely to show up than others - because they come from populations where marriage between cousins is (or was) more prevalent. For example, a recently-published research paper indicated that cousin marriages were still relatively common in the US in the first half of the 19th century - the effect of this is to make genetic cousins appear more closely-related than they really are. To get an idea of how this could work in practice, just imagine that the ancestors of everyone alive in the US today arrived on the Mayflower. There would be some DNA segments that everyone (or almost everyone) shared, so no matter how many generations went by, the same markers would be found. For a more modern example, see this story about identical twin sisters who married identical twin brother. If their offspring married (marriages between 1st cousins are perfectly legal in half of US states as well as in many countries, including the UK) they'd just be mixing up the same DNA. There are currently THREE offers that I'm aware of - see below - and I'll continue updating this article with any new offers that become available during the currency of this newsletter, so please check back before placing an order so that you can support LostCousins by using my links. Please note that the only DNA testing companies I've used and the only ones I recommend are Ancestry, 23andMe, Family Tree DNA, and Living DNA. If you’re ever tempted to buy a DNA test from a company that isn’t on that list I suggest you contact me first - it could save you a lot of heartache! By far the best test for knocking down 'brick walls' is Ancestry DNA - for a whole range of reasons, but most important for me is their enormous user base (around 10 miliion, far more than anyone else). But if you need to track your direct male line back more than 4 or 5 generations you'll need a Y-DNA test from Family Tree DNA - and the Y-37 test is currently discounted by $40. IMPORTANT: please log-out from Ancestry before clicking the link below. Cloning: Fido today, Grandpa tomorrow? Should you get your pet's DNA tested? According to an article in Science magazine you should exercise caution. But there's even more that you can do with doggie-DNA if you have the money…. In this Vanity Fair article you can read how rich dog-owners are paying up to $100,000 for clones of their recently departed pets. Ethically there's a big difference between cloning dogs and cloning humans, but I'm not sure that the science is so very different. A century ago eugenics was all the rage - see my article from April 2017 about Bernard Mallet, who was the Registrar General from 1909-20 and thus had the ear of prominent politicians. A generation later eugenics was tainted by the ghastly experiments carried out under the Nazis, but before long there will be few witnesses left - perhaps future generations will be told it was all a hoax? The good news is that nobody is going to want to clone you or me - anyone who has the resources to do it will want to clone themselves (or somebody important to them) - so we don’t need to worry that our DNA samples will be misused. Indeed, it's arguable that the more ethical applications there are for DNA testing, the more alert society will be to any misuse of the technologies that occurs. All of you will be aware that billions of email addresses have been stolen over the past few years, but in the majority of cases the hackers were unable to get their hands on the associated passwords. Nevertheless spammers are making the most of the passwords they've managed to steal from the more insecure sites, and are emailing users with threats, and demands for money - I've received several at my personal email addresses. Here are some tips that will help you stay safe. First of all, you can check whether your email address has been stolen by hackers. You can do this using the "Have I Been Pwned?" website (according to Wikipedia it holds records for nearly 5 billion accounts from over 250 data breaches, so there is a good chance your email address is amongst them). Secondly, you can use the same site to check whether your password has been stolen - I discovered that a password I used in 2005 appears in the list, though other more recent passwords don't (thankfully!). If your password is '12345' don’t even bother checking - it appears in the list over 2 millions times! Don't use the same password at multiple sites if you can possibly avoid it - there are password managers that will remember passwords on your behalf, so that all you need to remember yourself is the master password (ie the one for the password manager). You'll find a 2018 review of free password managers here. Whatever your password strategy, you can help me and help yourself by choosing a unique* password for your LostCousins account (or else stick with the temporary password that was issued when you joined). There is a warning on the My Details page, but I know from experience that people don’t always read instructions (including me on occasions!). Bear in mind that hackers also get email addresses from the address books of people whose email accounts they've hacked - so if hackers have got your email address they might have got it from one of your friends. They might even have got it from the Internet - it's amazing how many people have published their email addresses online at one time or another (Google will tell you whether you've done it yourself). If you chanced upon this book you might, given the pictures on the front cover, assume that it's only of interest to those who ancestors were ordained into the ministry. But if so you would be mistaken - for in fact, this comprehensive work devotes relatively little space to the clergy, focusing mainly on their flock. In other words, it’s a companion to the same author's Tracing Your Non-Conformist Ancestors which I wrote about in May 2017 (you can re-read that review here). The opening chapter of Stuart A Raymond's book provides a potted history of the Church of England and, whilst it's quite hard going, it sets the stage for what follows - so my advice is to stick with it. One particularly interesting fact I learned was that creating a new parish required an Act of Parliament - this helps to explain why the church was so slow to respond to the population movements prompted by the Industrial and Agricultural Revolutions. Chapter 2 is entitled "The Structure of the Church of England", and this helps the reader to understand why the records are organised in the way that they are. It also solved a mystery that I'd long puzzled over - why landed gentry had the power to appoint clergy in certain parishes. Many will also welcome the explanation of the changing meaning of the term 'curate'. Chapters 3 to 8 deal with the types of record you might find, where to look for them, and what they might tell you. There's also advice on how to assess the evidence you find, warning especially about the dangers of relying on transcripts. All very sound, and well worth reading no matter how experienced you are (or think you are!) - there were lots of useful snippets that I picked up along the way. Inevitably there is the odd blunder: on page 74 he writes that the copies of marriage register entries submitted to the GRO by clergy were recopied into the GRO's own registers - in fact the loose sheets were bound into the GRO's registers (so certificates ordered from the GRO will normally show the vicar's handwriting). And the short section headed "Parish registers on the Internet" on page 76 is horrendously out of date - whilst it ends with the catch-all sentence "No doubt many more parish registers will be digitized by the time you read this book", the text that precedes it could have been written years ago (and quite possibly was). Another surprise was that Dade registers are mentioned, but Barrington registers aren't - but these are all minor quibbles in the context of such a comprehensive work. In Chapter 9 the focus is on charities, missions, and religious orders, with a particular focus on their staff and beneficiaries - then at last, in Chapter 10 he comes to "Tracing Anglican Clergy". The final chapter details other relevant sources that have not been covered in the preceding chapters. 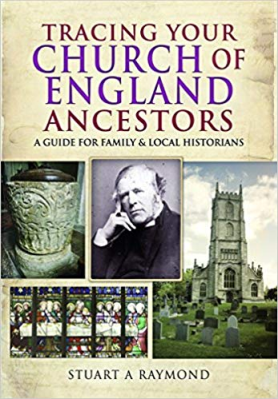 Read Tracing Your Church of England Ancestors to get a better understanding of church records and how they , not just the registers of baptisms, marriages, and burials that we're all familiar with, but also the lesser-known records that can provide added insight into our ancestors' lives. There is a Kindle version, but I suspect most people would be happier with the paperback - especially since you're likely to be able to buy the paperback more cheaply. Next Tuesday, 14th August, the latest genealogy mystery from Steve Robinson will be released - and it's well worth waiting for! 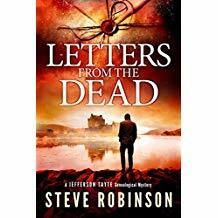 Letters from the Dead is the 7th novel to feature the cuddly American genealogist Jefferson Tayte, who has relocated to the UK from Washington. Now that he has a wife and child JT is trying to avoid dangerous assignments, and the task set by his Scottish client seems safe. But, as you've probably already guessed, it doesn’t work out that way - perhaps the fact that the client's name is Damian should have been regarded as a bad omen? However I'm glad to say that the worst of the violence occurs off-screen, so anyone who shared my concerns that these books were getting a little too gory will be relieved. The story switches smoothly between 21st century Scotland and 19th century India (still under the control of the British East India Company) and revolves around the disappearance of a fabulous - and possibly mythical - gemstone. Set mainly in Drumarthen House, the crumbling ancestral pile that's more of liability than an asset, the present day storyline is reminiscent of Agatha Christie's Ten Little Niggers as - one after another - the suspects became victims. But as in Christie's novels there are innumerable twists in the plot - more than once I thought I'd solved the mystery, only to discover that I'd got it completely wrong! Sherlock Holmes also came to mind, especially The Sign of Four - but was Steve Robinson simply stringing me along? You'll have to read the book to find out! Letters from the Dead is available either as a paperback or as a Kindle book - and you can support LostCousins when you use the links below (even if you end up purchasing something completely different). 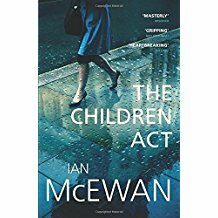 Just over two years ago I briefly reviewed The Children Act, Ian McEwan's novel focusing on a judge in the Family Division of the High Court, and the decisions she has to make, both in her work and her personal life. It's a wonderful piece of writing - I simply couldn’t put it down, reading the entire book in little more than a day - and I thought about it repeatedly as I was carrying out my jury service last month. I've just discovered that it has been turned into a film, which will be released in the UK on 24th August. Starring Emma Thompson, in a performance that Melanie Phillips in The Times described as "a mesmerising and intensely moving piece of acting", it promises to be one of the few films that lives up to the book on which it is based. This year's weather has been so topsy-turvy that I was pleasantly surprised to discover a good crop of blackberries in the hedgerows - and as a result I've been able to make a batch of Spiced Blackberry & Apple Jam. I first experimented with this jam two years ago, and found it delicious - if anything it's even better this time! You'll find the recipe I used here - though as usual I adapted it slightly, reducing the amount of sugar and adding a couple of handfuls of currants to give it a more Christmassy feel. For tea on my wife's birthday we had scones with freshly-made, and still slightly-warm, Spiced Blackberry & Apple Jam - absolutely delicious! Of course, you might be wondering whether I add the jam or the clotted cream first - but in fact I do neither! My healthy version of an English Cream Tea uses Philadelphia Light in place of the cream - just as tasty, but far fewer calories. Our elderberries are just ripening, so my next jam is likely to be Blackberry & Elderberry, a combination which I initially found a little bland, but later learned to love. I might even make plum jam this year - it’s the first time we've had a sufficiently large crop - though we also like them lightly-poached for breakfast (also very healthy, since I use stevia instead of sugar, and serve them up with fat-free natural yoghourt). Must remember to add some star anise - it really lifts the flavour! This week we had a new addition to our family - at least, it seems that way. I bought a Clever Dog WiFi Smart Camera so that we could keep an eye on our cat when we're away - and it has been fascinating, even though we've been at home all week! I bought mine from My Memory, but they're also available from Amazon. Follow this link to buy the same one as me - it's a better model, but only costs a few pounds more. Bev found young Emmeline in the 1861 Isle of Man census - she was staying with her maternal grandparents. The spelling of her forename is unclear, but could be either Emmelin or Emmelen. You can save 30% on any subscription to British Newspaper Archive when you follow this link (offer ends 25th August). The offer applies only to the intial subscription, so to lock in your 30% saving for a whole year choose the 12 month subscription (less than £5 a month). You can save even more than expected when you buy a DNA test from Ancestry.co.uk - the shipping charge has been halved. See the update email circulated today (17th August) to all UK members for more details. Please use the link in the article above so that you can support LostCousins.